The Hurricanes came into their midweek games against the University of Central Florida and Florida Gulf Coast University ranked 25th in the Baseball America poll, but couldn’t shake the doldrums from the weekend series at Georgia Tech. Miami lost a Tuesday night showdown with the UCF Knights 9-2 at Alex Rodriguez Park at Mark Light Field. Knights starter Tanner Olson pitched a brilliant eight innings, striking out four and walking none through 104 pitches. Canes starting pitcher Danny Garcia did not fare well against the Knights. In the first inning, Garcia faced seven batters, giving up the first two runs of the game on a sacrifice fly and an RBI single. Through two innings, the Knights already had eight hits. The Hurricanes showed a sign of life in the bottom of the third. Dale Carey and Garrett Kennedy were on second and third, with Tyler Palmer at the plate. Kennedy scored on a wild pitch from Olson after Palmer lined out to third, and freshman Willie Abreu flew out to end the inning. That was about all the Canes could muster. Garcia only lasted four innings on the hill. Subsequently, Enrique Sosa was called in the fifth and gave up two more runs in the sixth. The backbreaker came when a chopper to shortstop Brandon Lopez was bobbled, turning a possible inning-ending double play into what later amounted to a 5-1 lead for UCF. AJ Salcines, who has had the roughest season of all Miami’s relievers with a 18.00 ERA, came into the seventh with two on and no one out, and again couldn’t clean up the mess Sosa left. Salcines let two more runs (credited to Sosa) cross the plate in the inning. Zack Collins hit his third home run of the year just off the top of the left-center field wall in the bottom of the seventh, but by that time the game was long out of reach. 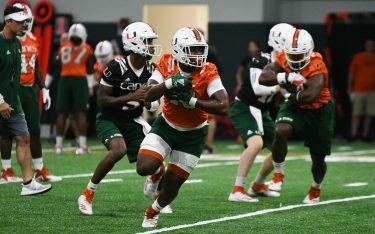 Even though Miami has gone 1-5 in its last six games, coach Jim Morris still maintains a positive outlook for his squad. Of note in Tuesday’s lineup: David Thompson did not start. Morris said a spider bit Thompson and his arm was swollen. 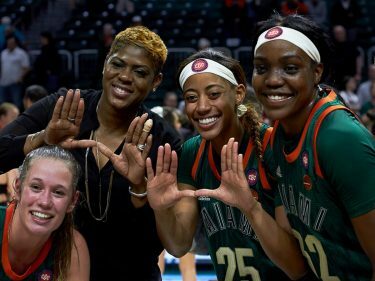 After a rough start to the season defensively, when the Hurricanes committed 15 errors in their first five games, the team began to even out last week in the homestand against Villanova and Boston College. But Miami is regressing back to early February. In the last six games, 11 fielding errors have been committed. Tuesday’s loss puts the Canes at 11-10. ACC rival Virginia, ranked No. 3, will be in town for a Saturday-Sunday-Monday series. All three games will begin at 7 p.m.